While Fox News continues to wipe the floor with its competition, the broadcast networks are emailing in yet another big story about favored Democratic candidate Hillary Clinton. 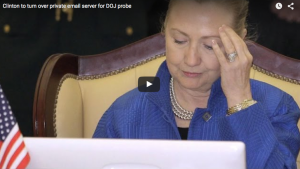 It was revealed Tuesday that HRC had dropped ‘top secret’ grade information in her emails – government property that was hosted on her own private server while she worked as Secretary of State for the Obama administration. The surreal and very dangerous scenario didn’t give two of the major three alphabet soup networks pause – they ignored the story entirely. You still don’t think the mainstream networks cover for the Democrats and their supporters?